This pattern was originally tied to imitate a cased caddis larva but has since taken on a far more versatile role. Tied heavily weighted on a size 10 longshank it still makes a useful pattern for early-season fishing, especially when trout are picking up caddis larvae trundling slowly along the bottom. On a normal size 10 wet-fly hook the Stick Fly becomes a great all-purpose nymph, its dark peacock-herl body set off by the short tail of fluorescent green floss. Peacock herl is one of the best and easiest to use of body materials and, as such, crops up in many top nymph patterns including the Diawl Bach and the Black and Peacock Spider. What makes it so good is its natural sparkle but it is also a delicate material and needs to be treated with care. The fibres on each strand of peacock herl lie in one direction so that to retain a fluffy appearance when wound, the herls should always be caught in point first. The natural taper of the strand also helps give the finished body a similarly tapered profile. To keep the effect slim, the strands should be wound without twisting, although on larger patterns gently twisting the fibres together gives the required bulk. However, care should be taken when doing this, as over-twisting will invariably cause the herls to break. 1. Wind close turns of fine lead wire along the hook shank to form a weighted underbody. 2. Cover the turns of wire with tying thread to fix them in position. As an added measure a few drops of Superglue can be added then allowed to dry first. 3. Take six inches of fluorescent green floss. Fold it in half repeatedly to form eight strands. Catch it in at the bend, allowing the waste end to fit snugly in the gap to the rear of the underbody. 4. With the tail secure, pull the strands of floss tight then trim them with scissors so that the end is perfectly square. 5. Take three inches of fine copper wire and catch it in at the base of the tail. Allow the waste end of the wire to fit just in the gap at the rear of the lead wire. 6. Take three of four bright, well-fibred strands of peacock herl. Trim the tips level then catch them in, tips first, at the base of the tail. 7. 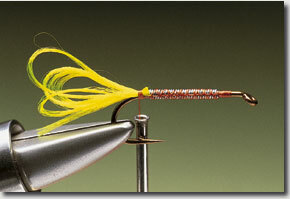 Wind the tying thread up the shank, stopping just short of the eye. Take hold of the strands of peacock herl and gently twist them before winding towards the eye. 8. Once the herl has reached the tying thread, secure the loose ends. Wind on the copper wire in open, evenly spaced turns. Secure the loose end then remove excess wire and herl. 9. Take a light ginger, or Greenwell, hen hackle and remove the waste fibres from the stem base. Catch the hackle in just behind the eye by this stem section. 10. 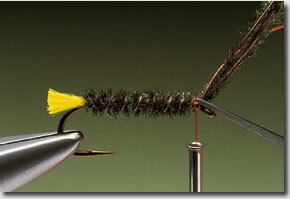 Grasp the hackle tip with hackle pliers and wind on two or three turns. The required effect is a relatively sparse one. 11. Secure the hackle tip and remove the excess. Stroke the fibres back over the body and position with thread. Build a neat head and cast off with a whip finish. The Stickfly is an effective pattern on virtually all types of lake and reservoir. Being a good, general imitation of a cased caddis larva it is also worth using on those natural waters that still have a good population of natural caddis flies. Tied in a range of sizes, the Stickfly will catch fish right through the season. However, it is a noted early-season fly especially when bank-fishing on reservoirs. Fished singly, a well-weighted Stickfly works best retreived slowly along the bottom. In calm conditions a floating line and long leader are the best tactic, switching to a sinking line when rough conditions produce excessive surface drift. Delicate strands of peacock herl can be reinforced by twisting them together with a strand of either tying thread or wire, before winding along the hook.